Ripple Rotation is a counted design by Kathy Rees which was constructed in quadrants that could be rotated to create different shapes. 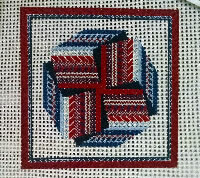 This variation reminds me of a pinwheel and is fun to stitch and watch the actual design emerge. This model is stitched with overdyed and solid Baroque Silk and Silk Lame Braid.The colors mimic a trip around the color wheel beginning with yellow, then orange, red, purple, blue and green. It's bright and happy! The kit is $100 which includes a 12 by 12 canvas – 18 count. Design size is about 8x8 inches. A hot air balloon from Kirk & Bradley caught my eye and this just seems to say spring! Use Gloriana silk, Pashmina, Neon Rays, Snow, Silk Lame Braid and a few beads to stitch Up Up and Away. I'm thinking a stand up finish, but a hanging piece would be fun, too. . The cost is $100 for all materials except stretcher bars. Raymond Crawford's Watermelon slice is the perfect palette for a sampler of stitches. Use yummy threads - Impressions, Buds, Threadworx metallic, Baroque Silk just to start! This 4 by 8 design would be fun on a picnic basket, or container for summer napkins or a tote bag - even the perfect sun porch pillow. Five color combinations are included in the kit for this fun charted design. Each stripe is a different stitch in the quadrants. Full kit available for $58 or chart only $15. Miss a Class? Ask about kit availability! Refunds will be issued for cancellations up to two weeks prior to class or if there is a waiting list. After two weeks,you may opt to purchase the kit at the same price as the class if you are unable to attend any session offered for that particular project. Canvas Enhancement – Have an old canvas that needs new ideas? Make an appointment for a personal consultation - $15 for the first hour and $10 per hour thereafter. Schedule a one hour private lesson any day between 10 a.m. and 2 p.m. for $10 and receive a 10% discount on your purchases. You can schedule a beginner’s lesson, just ime to learn a few new stitches or a newsession with stitch suggestions for a canvas. Please call us at least two days in advanceto insure you receive our undivided attention.